Schiller Park is bounded by Jaeger Street, City Park, Reinhard, and Deshler Avenues, this park was Village Center for festivals and neighborhood activities since the early 1800’s. Originally known as Stewart’s Grove, the area later, upon purchase by the City of Columbus, became known as City Park. 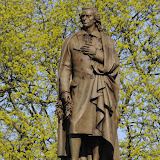 A fountain was built and a lake excavated, and in 1891 the Villagers presented the park with a bronze statue of German poet Schiller which had been cast in Germany and transported free of charge across the Atlantic. City Park then became known as Schiller Park. Anti-German sentiment during WWI pressured City Council to change the name to Washington Park. Several years later, at the request of South Side residents, the Council yielded and returned the previous name. As the Village grew, the park became the location for Oktoberfest, family reunions, sangerfests, The Ohio State Fair, a zoo, and holiday celebrations. Ground was broken June 1993 for Huntington Gardens, the promenade on the west side of the statue. The Huntington Garden Promendade is a model of partnership between public and private enterprises in the spirit of community reinvestment. Chiseled in granite in the Promenade that encircles the Gardens are quotes from Schiller, the German poet, playwright, philosopher, and historian and the namesake for the Park. a newly renovated recreation center, and most recently, the Umbrella Girl. In the 1920’s, her role changed. A copper umbrella was “jerry-rigged” with wires to shield her from the newly plumbed rain which continuously flowed down her umbrella while she again offered solace to park visitors from her new vantage-point in the center of a shallow pond. During the early 1950’s, her role dramatically changed. The umbrella girl vacated the pond, not by choice, and became Schiller Park’s “missing umbrella girl.” Even though searches were launched, newspaper appeals written and her story repeated countless times, her disappearance has remained a mystery. While the legend of her mysterious disappearance grew, so did villagers’ dreams of a new umbrella girl. Enter Joan Wobst, Columbus sculptor, who when approached by Janet Druen, offered to sculpt and donate to the German Village Society her version of an umbrella girl. And with that act of love, a new and exciting chapter of Schiller Park’s history began. The chapter unfolds with Joan’s vision of a young German girl rather than the goddess Hebe. Her model – her daughter Andi; her point of reference – Schiller Park’s German legacy; her inspiration – a village that cared. As Joan gave substance and meaning to hunks of clay, an endearing young girl emerged, clad in a dirndle and carrying her shoes while holding an umbrella. Meanwhile Phil Kientz, a village native, designed her home. The pond’s octagonal shape is her umbrella in reverse; the buff coloring of the sandstone complements both the bronze of the statue and other architectural elements in the park; the design carved into the stone panels is reflective of an early architectural motif found in many doors and cornices throughout the village. The Umbrella Girl fountain and the Grace Highfield Memorial Garden were dedicated on Sunday, October 13, 1996.